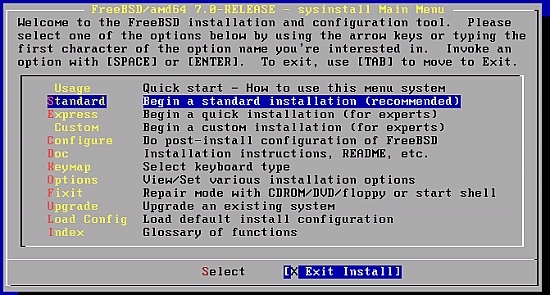 You will then go back to the sysinstall main menu, you can then highlight X Exit Install and press [ENTER]. Remove the CD, highlight [YES] and press [ENTER]. After the reboot you can login with root to do administrative tasks, however if you are logging in via SSH you will need to login using the user you created and then switch to root using the su command. Now save and exit the file, to save and exit just press escape then choose option a to leave and it will then ask you if you want to save or not. If you have chosen DHCP during the installation, you can follow the following steps to configure a static IP, just remember to exclude then the server's IP from the DHCP so that it wont conflict with another network device. Please change your hostname if it's not correct, it should be your servers' FQDN. As you can see above, we removed the word DHCP and typed our IP and netmask, and in a new line we added our router's IP. The Ports Collection provides a centralized and simple way to install softwares, it is designed to be automated and relatively easy to use. We will carry on the following steps also with the superuser. And choose the nearest server to you.